Professor Rachel Webster has had a stellar career teaching and researching astronomy for over 20 years. Originally gaining her doctorate thesis at Cambridge University, she has spent productive years honing her skills in Canada at the University of Toronto, both teaching and doing research. Her work has been internationally recognized with internationally prestigious scholarships. She was also the inaugural AIP Woman in Physics Lecturer. 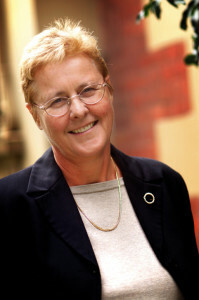 In 1992, she returned to The University of Melbourne to take up a position as a teaching and research academic within the School of Physics where she currently leads the Astrophysics research group comprising more than 60 research students and staff. Her group is varied and diverse and covers both observational and theoretical research areas. Her observational program utilises world class equipment such as the Australia Telescope Compact Array, the Gemini Telescopes, the Hubble Space Telescope and the Chandra X-ray Observatory amongst other instruments. She is a key member of an international consortium involving Australian and American astrophysicists who have designed and built a new low frequency radio telescope at Boolardy in Western Australia, known as the Murchison Widefield Array (MWA). This major project aims to detect the first sources in the universe. Such information is gleaned from her theoretical studies and detection of reionised hydrogen atoms and the structural analysis of neutral hydrogen clouds. Professor Webster's other research interests include quasar emission regions, gravitational lensing and cosmology; with a side interest in the physics of geothermal energy. Professor Webster is also a Chief Investigator at the Melbourne node of the national ARC Centre of Excellence for All-sky Astrophysics (CAASTRO), a Board member of Australian Astronomy Limited (AAL), and a keen rower.